Sunstone is mood-lifting and anti-depressant. It supports a sense of self-worth, and allows us to let go of feelings of failure, allowing the return of optimism and belief we can be happy again. On a wider level, it helps us to see the world, and the past, in a better light, and can clear and release old, stuck energy. Feldspars form an important group of silicate minerals. They are the most common minerals in the Earth’s crust, and a major component of most igneous (volcanic) rocks. 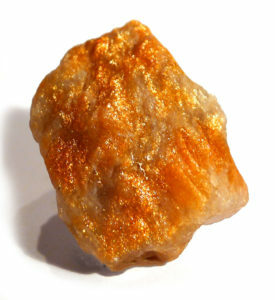 Sunstone is an oligoclase feldspar, or can also be a form of labradorite. It is orange-brown, with a shiny, metallic schiller, due to light reflecting off tiny platelets of hematite or goethite.